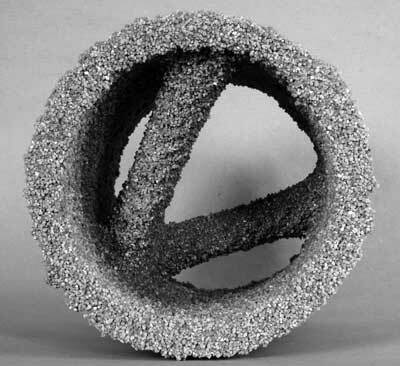 (Nanowerk News) Concrete components are traditionally made by casting. But the mold needed places significant limitations on design possibilities. 3D printing now provides new freedom in shaping. Researchers at the Technical University of Munich (TUM) are experimenting with various processes, including selective binding. This technology has made it possible for the first time to create intricate, bionic structures from real concrete. From tailor-made implants to weight-optimized aircraft and automobile parts: 3D printing has already become an everyday technology in many industry segments. And it's high time that architecture can benefit from 3D printing as well, says Dr. Klaudius Henke of the TUM Chair of Timber Structures and Building Construction: "Additive manufacturing is extremely attractive for construction: It enables a wide range of shapes at high levels of cost-efficiency, even in small batch sizes." Displayed on the researcher's desk is the prototype of a component created using 3D printing: a 20 centimeter high thin-walled concrete pipe whose interior contains intricate bracing which stabilizes the structure. "The design was inspired by the bone of a bird: Very thin and light, but still very stable," Henke explains. The bionic component is indeed extremely resilient. Material testing has shown that these pipes can withstand forces of up to 50 Newtons per square millimeter. This makes the printed material just as stable as conventional cast concrete. It would be virtually impossible to create the pipe with its thin bracing using classic concrete casting, in which a mixture of sand, cement and water has to harden in a form. The team used a still novel technology to produce the pipe: "selective binding". Thin layers of sand are doused with a mixture of cement and water at exactly those points at which the solid structure is to be created. Once all the layers have set, the surplus sand can easily be removed, leaving only the desired concrete structure. This is all simple in theory. The trick is of course in the details: First the TUM researchers had to build a selective binding unit. The over-dimensioned printer fills an entire laboratory room in the basement at the Chair's premises: Sand is distributed using an automatic scattering system. A three-dimensional system of tracks makes sure the print head can be positioned at any desired point in the working space and a nozzle can apply fluid to exactly the desired points. The researchers tinkered with the process for three long years: Success depends among other things on the thickness of the layers, the grain size of the sand, the speed at which the print head moves and the selection of the right nozzle. The engineers have optimized the various parameters together with the TUM Centre for Building Materials. Together with partners from industry, the team is currently developing a 3D printer whose print head will be equipped with several thousand nozzles. The device will make it possible for the first time to manufacture components with volumes of approximately ten cubic meters. "That's enough to create freely-shaped, storey-high components," Dr. Henke announces. The first test runs are planned to begin in the coming year. 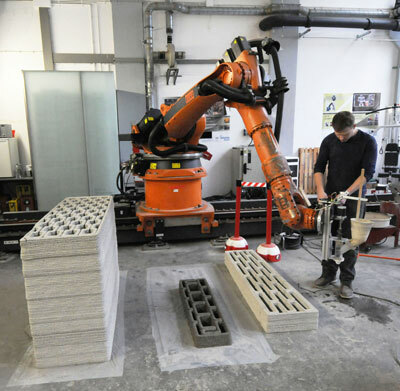 Dozens of teams are racing to be the first in the world to create the best and most effective process for additive manufacturing of concrete parts. Selective binding is only one of them. Another alternative is the extrusion method, in which pre-mixed concrete can be used. The TUM researchers have investigated and optimized this 3D printing method as well: " The advantage is primarily in the high construction speed. The selection of material components and formation of interior cavity structures make it possible to produce multi-functional components," Henke explains. For example, adding wood chips, which contain a large amount of air, provides integrated thermal insulation, protecting buildings from undercooling in the winter and overheating in the summer. The researchers at TUM have conceived and implemented an extrusion system for processing the new lightweight wood-concrete: The mixture of cement, wood and water is pumped through a nozzle, creating strands of concrete as much as approximately 2 centimeters thick. The nozzle is mounted on a computer-controlled robot arm that precisely places the strands on top of one another to form the desired structure. Using the extrusion method the TUM team has already succeeded in constructing 1.5 meter wide and 1 meter high prototypes made of lightweight wood-concrete. Lightweight wood-concrete is just as resilient and insulating as conventional gas-aerated concrete. The only disadvantage is the rough surface texture: the strands which make up the wall are readily visible. "This structure can be used as a design element or can be post-processed," says Henke: The lightweight wood-concrete is also easy to saw, mill and drill. The researcher is convinced: "3D printing will change architecture. The technology not only allows more versatile shaping, but also more variety, since each component can be individually designed without incurring any additional costs."